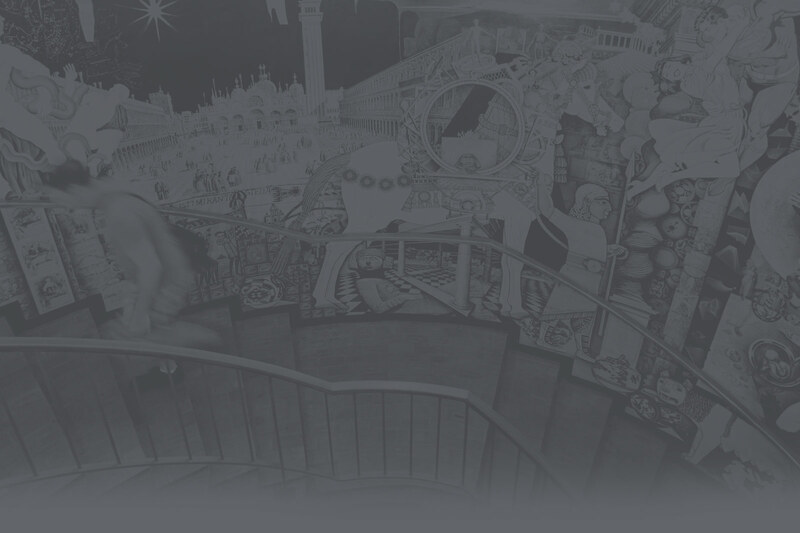 Welcome to the New Library Site! Welcome to the new site for the Coates Library at Trinity University. This post will serve as a brief guide as to what has changed, what new things have been added and where you can find the old things you might be missing. If you have comments, questions or suggestions about the new site, please send an email to epoff@trinity.edu. The redesign was done after carefully reviewing dozens of current college and university libraries – the good, the bad, and the ugly! We reviewed current general trends in web design, user experience best practices, and reviewed our own analytics to make decisions about how to structure the site. The site is designed with the desktop/laptop user in mind since almost 90% of our current visitors use these devices, but the site is fully responsive and will also work well on tablets and phones. The home page has been restructured so that most search needs are met from the tabbed search options at the top. In addition to Academic One Search, tabs to search Books and Media (Library Catalog), Databases (search by database name or subject), LibGuides, and Course Reserves are also available. Below the search console are links to some of our most viewed items and pages. Below the links is a redesigned banner system of news and events. We decided to rotate a series of three smaller square banners (as compared to one rectangular banner on the old site) so that items and events can be featured more prominently and scanned more quickly by users. We can add as many banners as needed and these will rotate three at a time. Next are links to student and faculty specific pages which will offer links to a variety of resources, tools and services for each group. The library’s special collections and archives deserve a visual footprint on the home page and so this section will allow us to feature pieces from our collection. This will be dynamic content – changing to focus on different collections at different times. Finally, our social elements round out the home page. Our twitter feed along with our new blog will serve as an opportunity for patrons to keep up with all things library! One of the main reasons we are switching to a content management system is to allow for more direct input from librarians and staff. The hope is to grow the blog as a resource and a way to communicate ideas, topics and events. A brand new feature of this website is a resource put together by First Year Experience Librarian, Anne Graf. The list of creative writing publications is for students who are looking for a place to publish their writings. 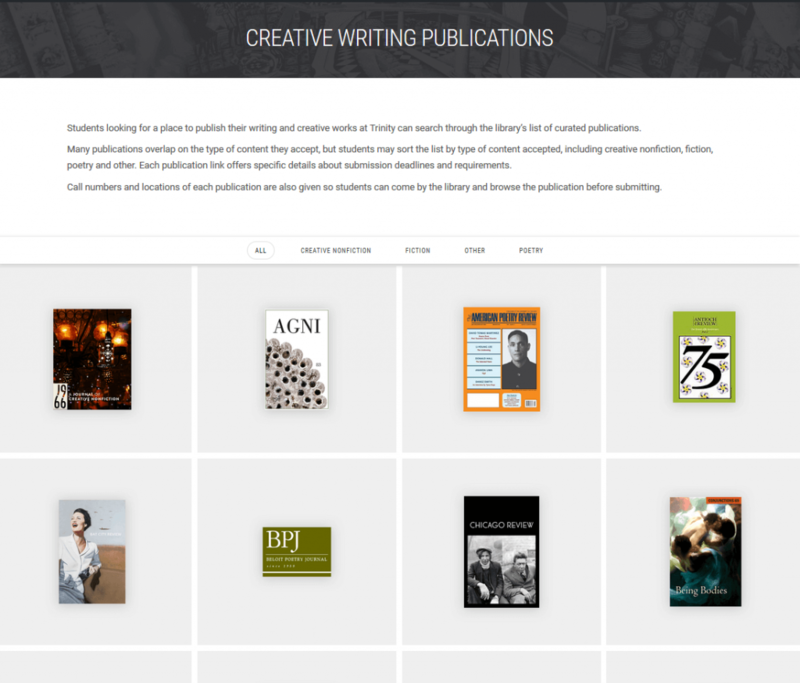 This visual portfolio of publications allows students to sort by type of publication accepted – creative nonfiction, fiction, poetry, and other. Each publication page contains information on where the journal can be found in our library, links to the publication website, submission guidelines, internship opportunities and contest/prizes offered. Besides the general redesign and restructure of the main page, a few other items have been adapted. After viewing user statistics and speaking with the librarians, it was determined that a restructuring of the content would help students find what they are looking for more efficiently and effectively. Previously, citation information was presented in a drop down menu structure where each content type of publication (article from an online journals, article in a printed journal, book with one author, etc.) 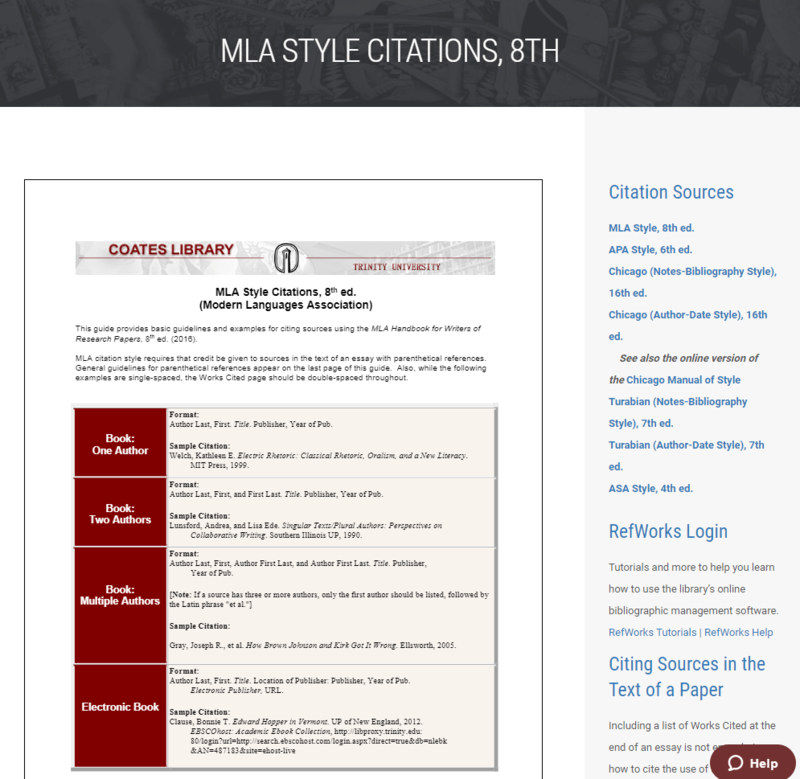 for each citation style could be accessed one at a time. We thought this might be more time consuming than needed, so we simplified the citation information, and embedded the printable style guides. These pdf files can be viewed on-page or downloaded and then printed, if needed. The information is now easily accessible without the need to click and search multiple times. Most old navigation items have been added to the new menu. The Research Tools menu item now contains the main “old” links from the previous site, so for those who don’t like too much change, hopefully this will help you get back to the links you know and love. In addition to the links at the top with sub-menu items, the footer also has quick links including categories for research tools, faculty and students. The menus available in both the header and footer are intended to improve overall navigation and functionality of the site. The current search option is tied to Google Search which will currently return search results that are indexed by Google and are part of the old site. Other site search options are currently being evaluated and we may opt for a different solution. Once the beta site replaces the old site and Google indexes the new site, the search results should be correct and relevant. We will monitor the situation and make changes as needed. The special collections and archives section still needs to be reviewed by the special collections and archive librarians. 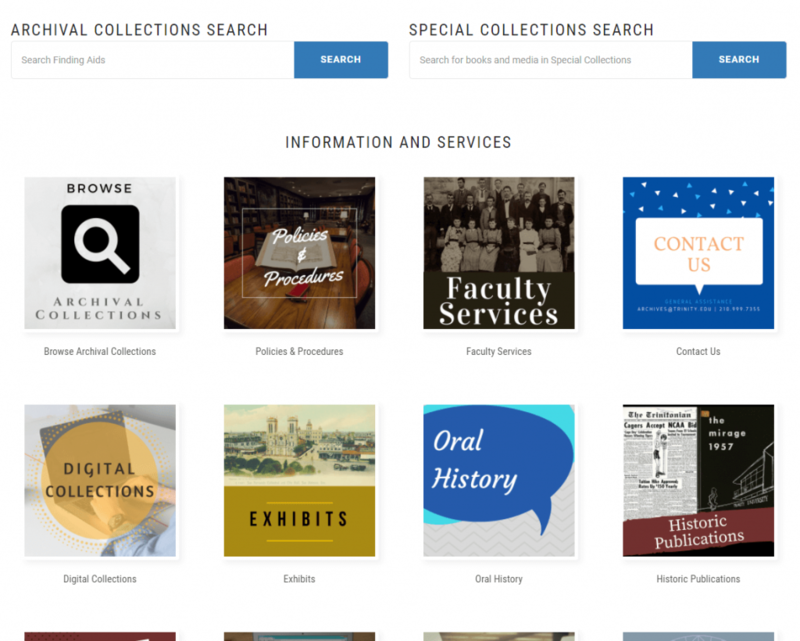 UPDATE: The Special Collections section has been redesigned to more closely match the look and feel of the faculty and student specific page. The page now offers two search boxes allowing on page searches for Special Collection and Archive items. Other areas are represented by a series of clickable thumbnails with visuals and text descriptions. The current list of searchable databases are linked to the old referral links system being used on the “old site”. There may be some links on this list that are not working – not all links have been checked. Before launch, the plan is to have these links moved to LibGuides and at that point we will double check that all links are in working order. UPDATE: The databases are all up to date and provide an easy way to search and go directly to the resources! Over the summer, we plan to create a handful of tutorials and change the layout of this site to accommodate new videos and make room for more as we grow our content. The current page showcases our “What is Research” suite of videos. UPDATE: The video library is online. We continue to update our offerings, but our newest additions include videos about using One Search, how to find a book in the library, and information about what a research appointment is. The hope is that this site will be able to adapt to the ever changing needs of this library and its patrons. If we see that something isn’t working, we can step back and make changes without needing to redevelop the entire site. We want everyone in the library and those who use the library to feel like they are a part of the site. Please let us know what you think epoff@trinity.edu.